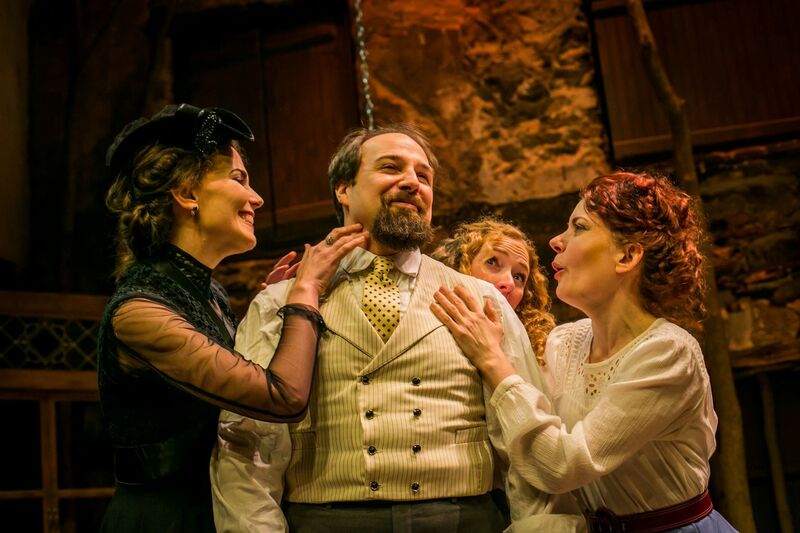 (Left to right:) Jessica DalCanton, Adam Altman, Sophia Barrett, and Jessica Summerfield in "Three Sisters," through March 3 at the Hedgerow Theatre Company. The characters in Anton Chekhov’s Three Sisters frequently profess their boredom. Thankfully, the production onstage at Hedgerow Theatre Company in Rose Valley through March 3 ensures the audience won’t suffer the same fate. Director Harriet Power works from Sarah Ruhl’s sharp 2011 translation, which blends the playwright’s idiosyncratic authorial voice with surprising fidelity to the source. The storytelling feels fresh and faithful — a sentiment matched by Hedgerow’s handsome physical production and the unaffected acting style of its company. Scholars and critics often classify Chekhov’s plays as comedies, a distinction that sometimes baffles English-speaking spectators. (I don’t know Russian, so I cannot attest to the knee-slapping possibilities contained in the original language.) Ruhl, by contrast, leans into the work’s darker elements; the only humor on display is of the gallows variety. Power picks up that thread with her actors. Even in the whirl of her birthday, Irina (Sophia Barrett) speaks of beloved, lost Moscow with ruefulness. A return to the city from her country exile seems less a promise than a pipe dream. Her pronouncements about the value of hard work sound more persuasive. Yes, Irina loses some of her trademark idealism here, but she gains a strong sense of self-possession in Barrett’s sensational performance. She’s not alone in being redefined. The drinking problem that consumes Raymond Saraceni’s Chebutykin comes across as appropriately grim. The soldiers who populate the Prozorov household (designed by James F. Pyne Jr. with superb detail that plays off the auditorium’s rubblestone walls) communicate an unspoken menace. Even the dotty factotum Ferrapont (Bob Weick) is stripped of his jocularity. This melancholy approach allows Ruhl to strongly consider the underpinning themes: loss of innocence, disappointment, and resignation. The production reinforces these realizations as spring gives way to winter, and years pass with little to show beyond a few more wrinkles on each brow. Justin Baker’s progressively dusky lighting further suggests youth in retreat. Although she sometimes plays to the audience rather than her scene partners, Jennifer Summerfield smartly avoids the trap of excessive drabness as Olga, who fears losing her spirit to toil as a teacher. Jessica DalCanton’s terminally unfulfilled Masha drips with ennui that turns to passion in the arms of her forbidden love, Lt. Col. Vershinin (Jared Reed, excellent if slightly too old). In keeping with Ruhl’s serious approach, Marcie Bramucci plays Natasha – the arriviste wife of brother Andrei (Adam Altman) – as less of a gorgon and more of a practical woman determined to rise above her circumstances. Among the large supporting cast, Susan Wefel brings quiet dignity to Anfisa, the family’s aged servant, and David Pica impresses as the insouciant soldier Solyóny. Philadelphia theatergoers have their choice of Chekhov this month, with EgoPo’s Three Sisters Two and Curio’s Three Sisters, By RashDash, after Chekhov running concurrently. Hedgerow’s treatment of the original warrants a trip to the suburbs. Three Sisters. Through March 3 at Hedgerow Theatre Company, 64 Rose Valley Rd., Rose Valley, Pa. Tickets: $20-37. Information: 610-565-4211, hedgerowtheatre.org.